This morning Aviary announced a new round of funding from our firm, Spark Capital, along with Jeff Bezos, Amazon’s CEO and existing angels. Aviary’s mission is to make creation accessible to artists of all genres from graphic design to audio editing. They have built a free, online suite of rich tools. Here’s a recent review of Aviary from the show G4. My colleague Mo Koyfman led our investment in the company and wrote up his thoughts on his blog. I am proud & delighted to be in business with Avi, Michael and the Aviary team. It’s amazing that such a small team could build something this powerful. If you haven’t already tried, check out Aviary today and start creating. We went to a kids Halloween party yesterday. My boy James went as your friendly neighborhood Spiderman. Anyway, tomorrow I’m on a panel with Howard Lindzon, Ron Conway and moderated by Robert Scoble. Should be fun. Why does cable television cost more than broadband? Our family pays about $50/month for FIOS broadband service. We get 20/5 Mbps. It’s a beautiful thing and is only going to get faster. We pay about $140/month for television which includes 3 HD DVRs. But there are other big differences. –Hardware. cabletv has a closed set top box. The internet allows me to plug in any hardware I want. –Software. cabletv comes with a UI that is broken and old. The internet allows me to use any software and UI I want. –Content. cabletv has a few channels that we love (live sports and a few network shows and aren’t available online (yet). The web has a ton of content sources that I use all the time. CableTV has 1080p video. The web doesn’t stream 1080p. I’m not sure I care about that anymore. At the end of the day, if we could only afford one of these things, cabletv or broadband, we would choose broadband all day long. That would be true if they jacked up our broadband price or if they dropped the cabletv price. I have a hunch many consumers would pick the web over cabletv as well. For now, many of us can afford to pay for both services a month and we do just that. But this quick comparison shows the value proposition isn’t right. We did a thing where we had two weeks to build something and demo. Build it, try it out over the weekend. If it sticks we may keep working on it. I was ripping out carpeting during a heat wave and then my phone vibrated in my pocket, and it was Ev. And it said he was sipping pinot noir. I realized I was totally engaged in this product. So we decided we should keep working on it. At the beginning it was “okay this seems compelling”. Early on someone said “twitter is fun but it isn’t useful”. Ev said “Neither is ice cream”. So what if it’s just fun? SXSW 2007 was a huge watershed moment for us, first time we saw real potential in the tool. Saw people tweeting about a good session to go to. There is only way to listen to this song. Turn up your speakers and enjoy. Much has been said about the issues facing publishers and advertisers particularly when it comes to branded advertising. My head always hurts when I hear people say that at least with television, brands can safely advertise their brands. Yes, television has been a success story when it comes to branded advertising. The dollars are big. Forget big, they are enormous. But I’m convinced that it’s a fragile business. First, it’s not growing. And our attention is shifting. Even if Nielsen says we are all watching 25 hours of TV per day we know it’s not true in our hearts and our brains. The second the TV commercial comes on we whip out our mobile phone or we turn our eyes to our laptops. Or we just click thru the ads on our DVRs. Yet online branded advertising has real challenges. The current search business doesn’t deliver branded advertising. The classic banner ad if targeted works well for many things – except branding. To make display advertising ads friendlier to brands, new formats are being introduced like this super sized banner ad I saw on Alley Insider today. 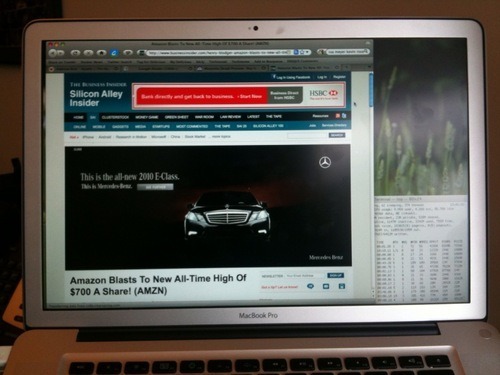 To give you an idea how big that Mercedes ad, that photo is my 15" MacBook Pro which has a 1440×900 display! I’m not sure this format is the best for publishers, advertisers and consumers. I have a feeling it’s not. But I am optimistic that there will be more compelling solutions for branded advertising. I’ve seen a number of creative ideas & technologies over the past few months and I’m sure we’ll see others too. If you’re not going to take risks and you don’t think the future is bright, the Internet is probably not the right place for you. This is one of my favorite songs by the Clash. Nothing like the original but this version holds its own.